CORE projects should be innovative and of high scientific quality. All projects are peer reviewed by international reviewers. 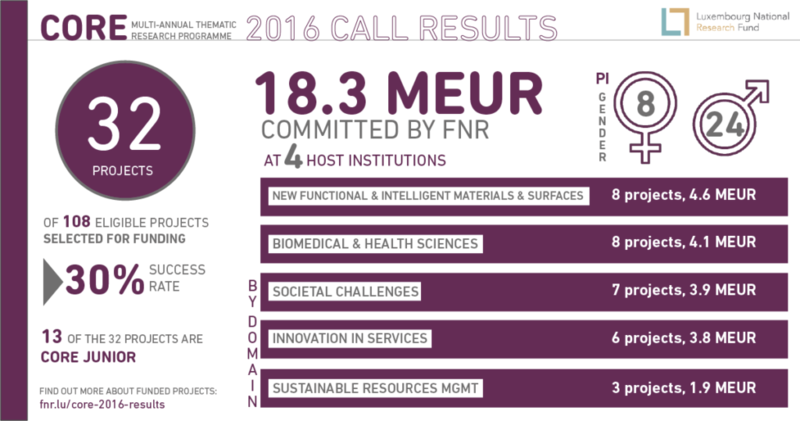 The Fondation Cancer has agreed to join funding for CORE 2019 projects. Applicants have to provide evidence that these cancer projects are in line with the CORE domain of ‘Biomedical sciences’ and comply with the topics of the Plan Cancer. The projects will be evaluated within the CORE selection process. CORE projects have a lifespan of 2 – 3 years and funding is allocated on a competitive basis. 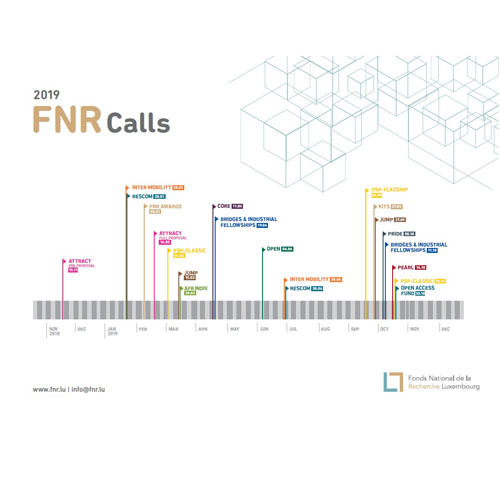 The FNR allocates a maximum financial contribution of 18.5 MEUR for the CORE 2019 Call. First time CORE applicants are strongly encouraged to contact the FNR for additional guidance prior to submitting a research proposal. The Principal Investigator (PI), author and leader of the project, is asked to submit proposals which are appropriate to their track record and experience. Postdoc & early-career researchers may apply for the programme through the CORE Junior Track, a dedicated framework for less experienced PIs. Launch of 2019 Call: Thursday, 13 December 2018. Deadline for submissions is Thursday, 11 April 2019, 14:00 CET. From the CORE 2019 Call onward, a specific format requirement for the project description is introduced. The FNR implements character limits for the project description instead of page limits. The character limitation has successfully been introduced in other FNR programmes already. Please carefully follow the specifications for the Proposal Project Description defined in the CORE Application Guidelines in section 6.1. All applications have to follow these requirements and it is mandatory to use the CORE 2019 Project Description Form. The FNR has signed the “Declaration on Research Assessment (DORA)” and therefore has introduced changes in how it assesses research proposals. This means that FNR evaluates quality and impact independently of journal-based metrics and give value to all research outputs. The call related guidelines have been adapted accordingly. Bilateral projects with project partners requesting funding, e.g. DFG (Germany), SNF (Switzerland), or FWF (Austria), may be submitted under the lead agency principle. 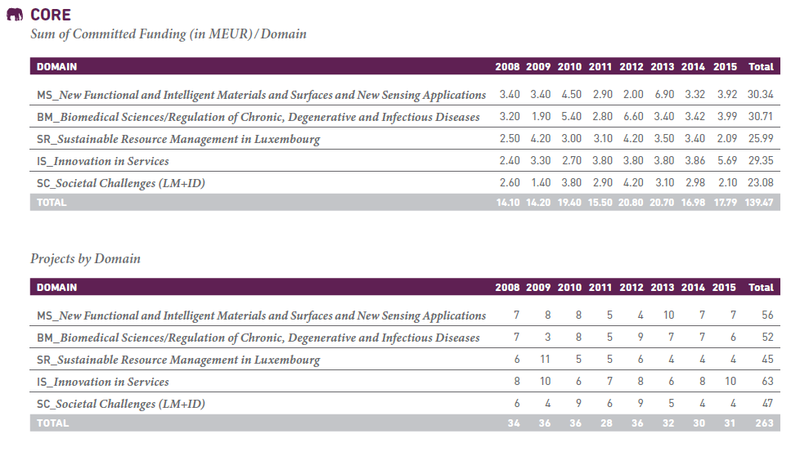 Further collaborations are, for example, possible with Poland (in ICT) or with EMBL (in Biomed). These bilateral projects fall under ‘INTER’, the FNR’s umbrella for international cooperation.